We posted a few weeks back about making your own Bean Bag Toss. We also mentioned that we were going to give the Bean Bag Toss we made to friends of ours as a gift. We wanted to customize the toss, so we decided to add some vinyl. Our friends just built a game room/bar next to their home *which is on acres of land out in the middle of no where. They have dubbed their new game room/bar as “The Joint in the Woods”. We figured it would be most appropriate to add “The Joint in the Woods” to the Bean Bag Toss. I’ll tell you right now–I don’t have the best patience when it comes to applying vinyl. It can twist, tangle, and adhere to its self. Plus I can never seem to line it up straight. I do have the transfer paper which helps, but I’m still not 100% at the applying vinyl part. Mr. Woodsy and I agreed that I would cut out all the lettering and then he would apply the vinyl letters on to the Bean Bag Toss. Team work at it’s best! You’ll notice in the pictures that their are paper cut outs everywhere. That’s because I do a mock up for size and spacing prior to cutting the vinyl. I want to make sure that I’m not wasting one scrap of vinyl (lets face it–it’s expensive). Plus this gives you a good idea of what the finished product will look like. 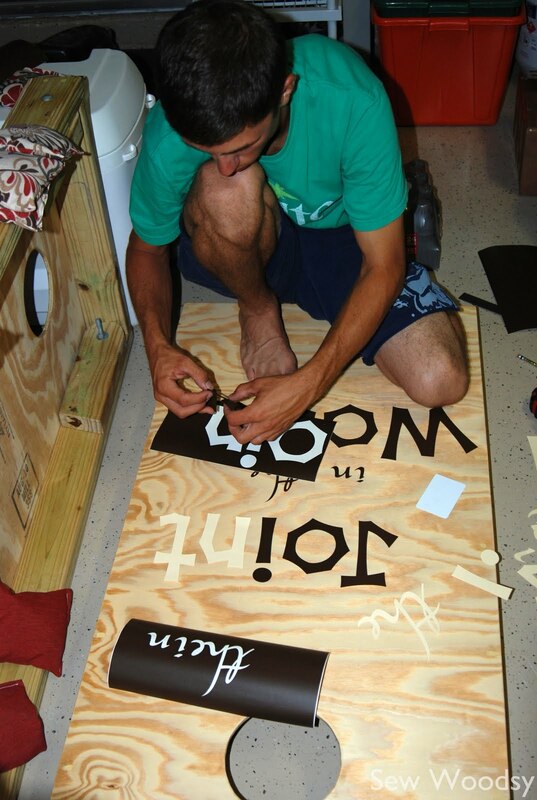 Mr. Woodsy likes to measure out and draw a line (on the surface) where he will be placing the letters with a pencil. Just by Googling I found tons of tips and tricks for cutting vinyl. If you buy the Provocraft vinyl they give you all the settings on the directions. We used the basic shape settings for “joint; woods” and the intricate settings for the cursive words “in; the”. I use the kiss-cut method if we are peeling off the letters and placing them our selves. I use a full cut-through method if I am using the transfer paper. Hope this tutorial helped. Feel free to e-mail us with any questions. What do you think of our now customized Bean Bag Toss? *Our friends absolutely loved them! Disclaimer: Provocraft did not provide us with any of the materials used nor are we being compensated for this post. This post is purely my own thoughts and opinions. Thanks for the info, I thought I knew all I needed to know about cutting vinyl, but you helped out a lot! Very cute idea! Thanks for coming by and saying "hi" on my blog. Have a great weekend!